The Breeze Booster tm collects the smallest breeze and directs it down the hatch and into the boat. It is self supporting and does not require supporting lines or halyards to keep it in place. This makes it perfect for any powerboat or sailboat, monohull or catamaran - regardless of hatch placement. With only two simple steps the Breeze Booster tm can be installed over your hatch in seconds. 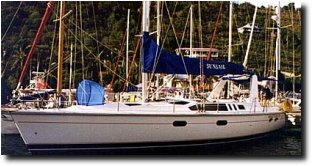 It can be faced in any wind direction, which is especially important if the boat is located in a marina. It can be left in place with the hatch open, partially open, or even closed in the case of sudden rain showers. The Breeze Booster tm can be easily closed to the size of a large umbrella for convenient storage. 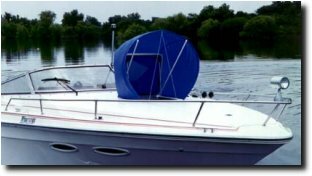 The Breeze Booster tm is constructed of durable flag stock nylon and fiberglass bows with all parts assembled and ready to place on your boat.